Roulette is a game played in both brick-and-mortar and online casinos; its name derives from a French diminutive that means “little wheel”. The game rules say that a player can place bets on a single number or a range of numbers, on black or red, on odd numbers or even numbers. The casino employee that is handling the Roulette is called a croupier; his job is to spin the wheel in one direction and the ball in the opposite one. The ball will spin on a track ring around the circumference of the wheel – at some point in time it will lose speed and fall into one of the 37 red, black or green pockets (38 in the case of American Roulette). The first, primitive form of roulette was introduced during the 17th century by the French mathematician and inventor Blaise Pascal. This device was a part of his search for a perpetual motion machine. The roulette game is supposed to be a mix between a certain English wheel game and a French board game that existed in those days. 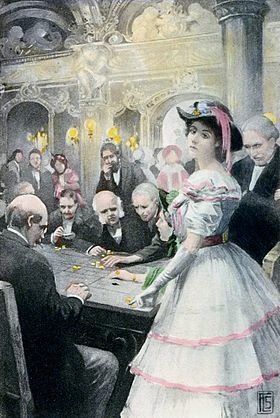 The first description of the roulette came out in 1796 from France in the form of a novel – “La Roulette, ou le Jour” – that described the game as having two slots for the bank, thereby creating an advantage for the casino. The first roulette wheels used in France during the late 18th century had a black pocket for double 0 and a red one for single 0. To avoid any confusion, green was selected to represent the zeros in roulette wheels starting in the 19th century. Also during the 19th century, in the German town of Homburg was introduced the single 0 style roulette wheel by the Blanc brothers; this was their idea and its purpose was to create an advantage against other casinos, who had a traditional wheel with both 0 and 00 pockets. In the 19th-century USA there were different forms of roulette wheels: they had roulette variations featuring 0, 00 or an eagle – the latter was also a bank pocket and symbolized the American liberty. But soon the eagle was removed from the game and only the numerical pockets were retained. Nowadays, there are only six authentic American Eagle roulette wheels and they are worth tens of thousands, perhaps hundreds of thousands of dollars. After the 19th century, the roulette wheel could be found all over the world, both in Europe and the USA, and it became one of the most popular casino games. 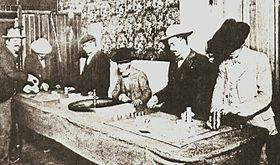 The Blanc brothers had to move out of Germany because the government there banned all gambling activities, but found a safe heaven for their game in Monte Carlo, where the last remaining legal casino in Europe was located. Soon, the city-state and its casino became a place for gathering and play for Europe’s elite and aristocrats. The Monte Carlo establishment popularized the single 0 roulette wheel until it became the most played casino game, earning it the title of „King of the Casino Games”. The single 0 roulette fever spread all over the world, except the United States, where the double 0 is still the dominant variation. In America, the double 0 wheel was highly favored in the States that had a French majority, e.g. Louisiana (especially in the city of New Orleans), and from there expanded westward. 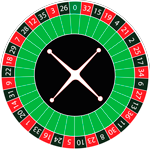 Because both casinos and gamblers were trying to cheat, the roulette wheel was transposed above the table so that no devices could be mounted underneath or even inside the wheel; at the same time, the betting layout was simplified. From these early times, the new American layout was developed and an array of makeshift games was set up. Meanwhile, the French version evolved in style at Monte Carlo. Nowadays, the American roulette layout and its simple way of betting together with the French wheel format dominate the casino floors around the world. During the first half of the 20th century, there were only two important casino cities in the word: Monte Carlo in Europe, using the single 0 roulette and Las Vegas in the USA, using the double 00 roulette wheel. Starting from the 70′s, casinos began to bloom around the world. The North American continent and its Southern counterpart still favor the double 0 wheel, while the rest of the world gives preference to the French version of the roulette.